Top 7 Shop Tools For Building Bikes! The following list of shop tools for a bike or automotive shop is not an exhaustive list to go by. There are many tools and machines you'll need. I simply covered the top 7 machines that you'll need to properly build a frame or bike from the ground up. The English Wheel and a Planishing Hammer are not required shop tools for building a chopper chassis but you’ll find them to be a big help when you use them for smoothing out sheet metal and shaping it. They go hand in hand. In other words, if a shop has an English wheel they will most likely have a planishing hammer as well. Smoothing TIG welds or building a seat pan, bike fender, or oil tank and fuel tank then you will need these tools for sure. In many ways they are a metalworkers ‘artists paint brush’ and with these tools you’ll make your own one-off style custom builds. You’ll find that using these tools can be challenging at first, but over time you develop technique and you’ll enjoy the result and process more and more. Metal Inert Gas, or GMAW which is ‘gas metal arc welding (MIG) is commonly referred to as wire feed welding is excellent for tack welds, one handed. A heavy duty MIG with big amperage is not needed for tack welds. You can make do with a 110 volt standard outlet and buy a low priced buy high quality MIG welder for this job. Stick to the name brands if you can, or get this one (it’s good). MIG welders are common shop tools found in just about every fabrication shop because it's good for welding all types of metal. Tungsten Inert Gas (TIG), is also known as Gas Tungsten Arc Welding (GTAW), and it also known as HeliArc welding, is what many shops use to finalize or finish their welds. Many TIG welders use a 220 volt outlet (or current), but you can find some decent machines at 115 volts as well. However, you can buy a dual voltage welder that will work off just about any outlet so that you don’t have to upgrade your 110 volt if that’s all you have. (Same with MIG welders). TIG requires a shielding gas, which is usually Argon. TIG is not easy to pick up on your own but it’s possible with the new welders and DVD instruction, but it’s a good idea to get hands on training at your local JVC or even pay a local welder to show you the ropes. You’ll discover that a mid level TIG welder can weld many different types of metal including copper, chrome molly, aluminum, brass, and stainless steel as well as some others, and you can weld at just about any thickness (depending on your machine). For example, you could weld material as thin as a razor blade, or as thick as half an inch or more (see the guidelines on your welder). TIG is what you’ll use to finish up your project, assuming your project requires strong and clean welds. But then again, you’ll find some steadfast MIG lovers that will swear up and down that they can tack weld and finish up a project just with MIG. 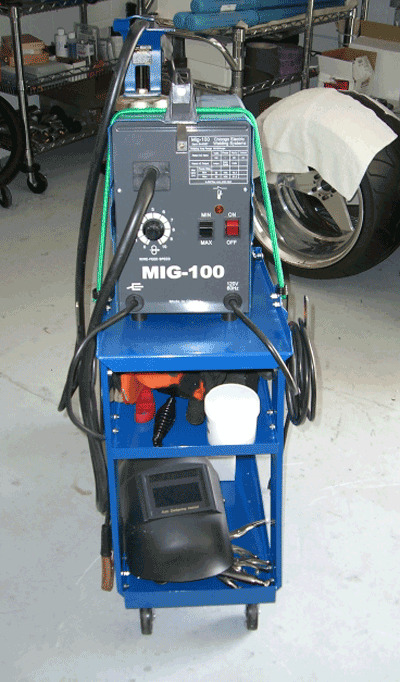 This is a well priced, excellent quality TIG welder. A The Metal Lathe is another shop tool that is not required to build a chopper or bobber chassis but it is really nice to have around when you need to fabricate smaller parts including spacers, grips, or bungs. Bungs, amongst others. A big Metal Lathe is no required. A smaller machine is not big enough either. So you should find a metal lathe that is seven inches to nine inches. This type of machine requires practice and instruction to use well and safely for machining threads and tapers. A box or column Vertical Mill is also not required but it if you have a drill press, a vertical mill is going to be a big help. What it is is a machine for small projects where a drill press is needed but needs more precision, has a variable speed option and a movable base. So, for example, if you need to get small parts sized properly, it’s easy with a vertical mill. Use this in conjunction with a metal lathe, and you can make custom parts in a snap. A Chopsaw is just that. A chopping saw. It’s definitely going to part of your shop tools if you are going to building any metal that requires good cuts. It's something you’ll need in your shop if you don’t have one already or you are in the process of putting it together. You can get a away with using a grinder for some cutting but a chopsaw does the job faster, better, and easier. You’ll use a chopsaw to cut metal down to the size you want, especially if it’s metal that is larger in size like tubing, for example. A Bench Top Grinder in the size range of six inches to eight inches is also a required tool for your shop. A Bench Top Grinder or a Pedestal Grinder will hold (usually) 2 wheels for grinding. If you replace one grinding wheel with a wire wheel you’ll be able to grind metal (or material), and also soften it up. It’s also used to ‘debur’ most metals and materials. 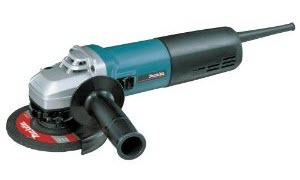 Angle Grinder: These are used very often in fabrication shops to remove debris from your projects, and also from your shop tools. You can use it to debur, clean, strip, and polish your various metalwork. In addition it is versatile enough to be used for cutting or sharpening metal and tools. This is a good one. Cutting Torch: A cutting torch can be used for all kinds of time saving tasks such as cutting off bolts, cutting sheet metal, cutting through thick metal, and much more. Ron Covell shows you how to use a cutting torch in his Roadster Building DVD series in a few unique ways. Tube Bender: A tube bender is a very helpful shop tool for building a chopper or bobber frame, or for many other fabrication jobs that require bent tube or pipe. 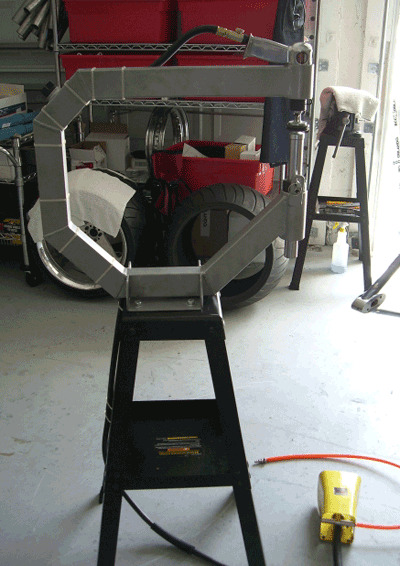 You'll need a tube bender for jobs that require bends more than 10-15 degrees. They are not very expensive these days. Or, you can do it the old fashioned way by making some 'shoes' that you use similar to using 'dies'. Once you set this up, use an acetylene torch and heat the heck out of the tube using a rose bud tip, and the start bending it around your 'shoe'. 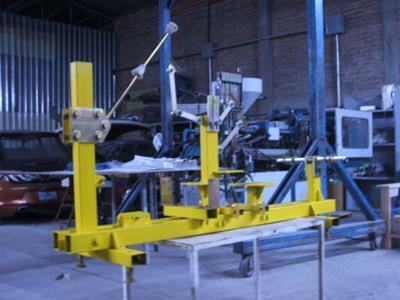 Frame Jig Completed By Our Friend Juan José From Richmond With Our Plans. 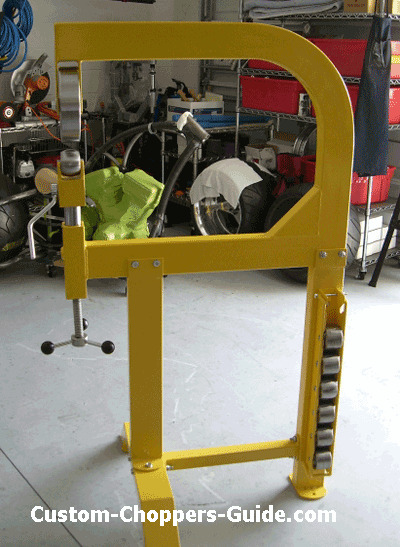 Frame Jig: A motorcycle frame jig is necessary as you build your frame. You need this frame welding jig because you want to not only see how your frame is going to look prior to welding it together, but you need something to hold it together and centered.